Or at least this is what it looked like when I opened it for the first time in my text editor (TextWrangler on Mac OS X 10.8.1 with English system locale). 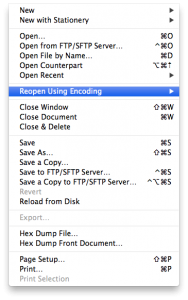 While TextWrangler (like most modern text editors) offers the option to set the proper encoding for each file, it failed at identifying the correct encoding right away and interpreted the file contents as “Western Mac OS Roman”. The garbled text should read the names of the census tracts in Japanese script. 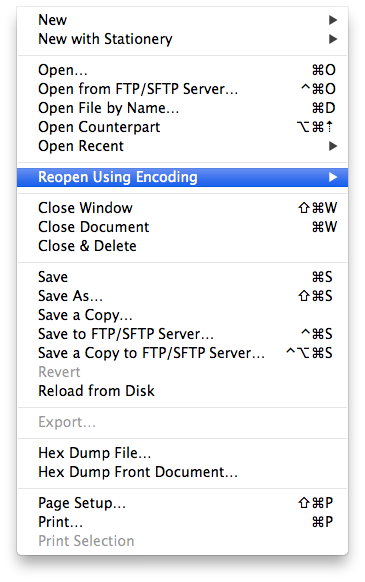 Yet, TextWrangler offers a nifty menu option called “Reopen Using Encoding”, which does exactly what it says. It requires you to know the encoding of your file, though. 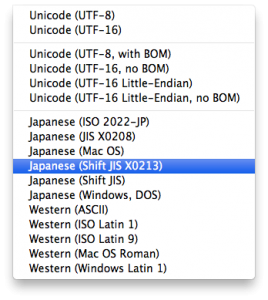 When it comes to Japanese text encodings there is an irrationally large selection of partly similar yet incompatible encodings to confuse even the most diligent user. From my previous experiences with datasets by Japanese public authorities I took an educated guess of “Shift JIS X0213”, which produced the expected outcome. The first part of each line (i.e. dataset) uses fixed width columns, yet with an additional space in between the columns. The last four columns, which contain the actual numeric population data, are separated by commata (“,”). The first line provides header information for those comma-separated columns, yet not for the former fixed-width columns. Null values for those columns are provided as dashes “-“. Why are there two sets of coordinates provided to each dataset (the last four columns)? Why is the building block ID split up into three columns (the second to fourth) while it exists in its concatenated form in the corresponding dataset? I decided to postpone dealing with the first question until I was able to display the data on a map. 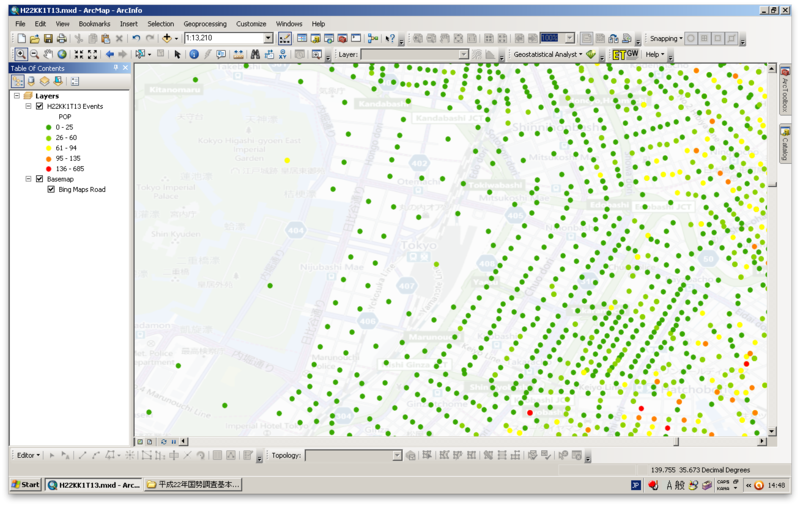 The second question, together with the need to merge the attributive data from the first file with the spatial data from the second file, and the mixed column separators I mentioned earlier made it obvious to me that this should best be tackled using a Python script. This would also help me in a next step to perform this process on all the datasets I received, one for each of Japan’s 47 prefectures. Thereby began the struggle to work with non-ANSI encoded data in Python. I’m writing this down here, since it took me quite some time for research on numerous websites to find out how to best deal with encoding-related issues in Python. So in the future I will have these notes as a starting point. Also, I hope to be able to provide consolidated information for fellow developers struggling with these problems. The code I came up with in the end might not be perfect, pretty or high-performance for that matter, but it works for me. Please feel free to comment or correct me where deemed necessary – I’m always open for improvements! I decided to first process the file containing the spatial coordinates, since this would allow me to append them easier to the attributive data contained in the other file. Therefore all I needed from this file was the identifier of the census block (which I called “PID”) and the two coordinate pairs ((X1,Y1),(X2,Y2)). 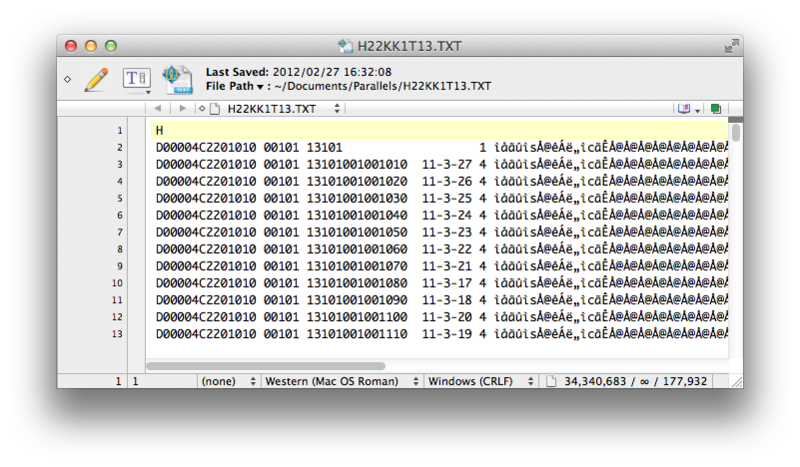 Please note the fact that the coordinates are concatenated by commata “,”, since this would be the field separator used in the final output file later on. After creating an empty list I start filling it with entries by appending data. This data is coming directly from the current line of the input file, using the Pyhton style “slices”. 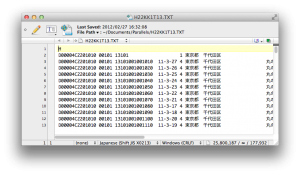 For example the field “FILEID” contains the first 14 characters, the field “F2” contains five characters from position 15, and so on. 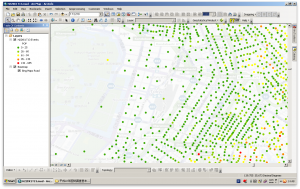 I also decided to enclose the string data in double quotes (“””) for easier import to software packages like Microsoft Office and ESRI ArcGIS. It is worth noting here how I had to regard the input data as unicode strings, since some of the trailing spaces were not simple spaces but unicode whitespaces (such as Ux0500), that needed to be removed using the .strip() function. Regular (i.e. non-unicode strings) also have a .strip() function, yet this will not remove those unicode whitespaces. The same is true for fields “F10”, “POP”, “POPM”, “POPF” and “HH”, where the latter contain the actual demographic data (population total, male, female, number of households). 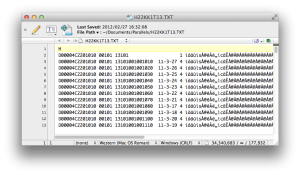 The data is read from the Python dict I created earlier using the “PID” as identifier. Since the returned string contains no unicode information, no special handling was necessary. I only had to catch those cases where no coordinates were provided (such as for aggregate regions), where I had to manually provide “empty” coordinates (0,0,0,0) using an if statement. Lastly I concatenated all elements of the Python list using .join() and commata (“,”) as field separators. Since I included my own proper first line due to the useless character of the original header line, I needed to make sure not to write it to the output file. I did this by identifying the correct lines by their first character “D”.